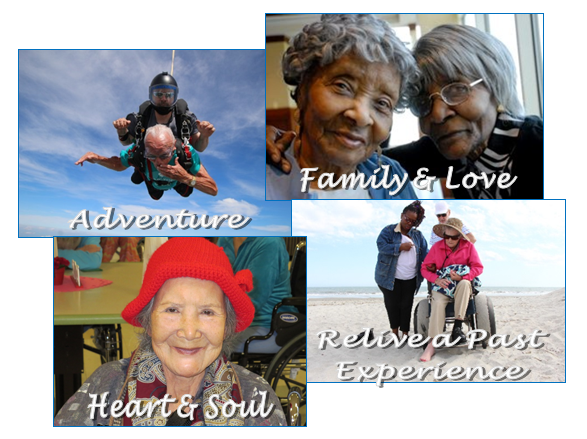 Second Wind Dreams is recognized as the FIRST in the United States to focus on enhancing the quality of life for elders and changing society’s perception of aging by making elder dreams come true. ​Our award-winning Dreams program is a powerful way to connect society to a forgotten truth about elders: the truth that age does not erase hopes and dreams. Since 1997, over 10,000 dreams have come true through our program, an average of 6 dreams per day. As each dream is fulfilled, we witness a ripple effect as the impact spreads from the elder to everyone who helped make it a reality. From the simple to the sublime, dreams come true! Join the Second Wind Dreams mission to change the perception of aging. Register your elder care community or business and take person centered care to the next level. We have the plan and the program. Now we need YOU to help realize your elders’ dreams as together, we bring them to fruition. Let’s get started!